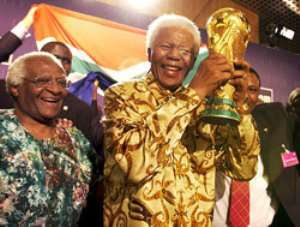 Watching South Africa finally win the rights to host football's world cup in 2010 last Saturday was a strange experience for me. On the one hand, I like many Ghanaians and indeed a greater number of people on the African continent felt a deep sense of satisfaction that at long last the World Cup was coming to Africa and to a country, which has been freely associated with the continent. On the other hand however, I couldn't help thinking what the triumph by the Rainbow nation meant for Ghana's own ambition of hosting the 2008 African world cup as a means of boosting facilities here. Ghana of course is in the race to host the 2008 African Nations Cup with the South Africans and Libya who had their bid for the world cup spiked by FIFA at the last minute because it just didn't match up. And the decision on who will host the 2008 Nations Cup will be made by the twelve member executive council of FIFA in July after CAF inspects facilities in the three bidding countries in June. Getting that championships will be a tall order for Dr Kofi Amoah and his men on the Ghana 2008 bid committee. And it is easy to see why. There sure will be a lot of sentiment when the twelve members of CAF's executive council sit down to decide the Nations Cup host in July. The whole continent was immersed in the joy of South Africa's triumph in Zurich. More important is the fact that after the inspection of facilities in the three countries, the Rainbow nation will be found to have all the facilities in place to stage the championship if it was taking place next year. On its rounds before voting for the world cup, FIFA's inspection committee said they found the state of facilities in South Africa excellent. The FIFA team found that the country was ready to host the thirty-six-team event. More impressive was the fact that the country has three stadiums "almost ready" to host world cup matches whiles five good stadiums need renovation to bring them up to world cup standards. Their telecommunications facilities according to FIFA are excellent for organising the world cup whiles transportation, FIFA says is very good for a major event like the world cup. It was this report that many believe won South Africa the World Cup. It could also be this that denies Ghana the 2008 African Nations Cup. Officials of the Ghana 2010 bid agree that South Africa will be Ghana's main challenge for the 2008 African Nations Cup. Alhaji Jawula who oversaw the African Youth Cup and the 2000 Nations Cup, which Ghana hosted, jointly with Nigeria says the main battle will be between Ghana and South Africa. And that even is overlooking Libya's wealth and the money they have at their disposal, which could sway votes in their favour. The Libyans got a terrible recommendation by FIFA when they went round inspecting facilities for the world cup but the world cup is a completely different game from the Nations Cup and the North African country should be in with a decent chance of landing the event. Ghanaian officials including bid chairman Dr Kofi Amoah have built a good case for Ghana. Fully aware that advancing the case of facilities won't sell much, the Ghana 2008 bid have made a conscious effort to emphasise what CAF wants the Nations Cup to do for the infrastructural development of countries. It's been argued that CAF finds the nations cup a perfect foil for countries to boost their facilities for which reason, no country can be denied the right of hosting with four years to go especially when its government has served notice that it is willing to provide the needed finance to upgrade facilities and is committed to organising CAF's showpiece event. The lesson in that is that while South Africa might have excellent facilities by FIFA's standards, it will do the overall continent no good if countries with excellent facilities are always granted hosting rights. If that happens, then a huge gap will develop over the years between the haves and have-nots on the African continent. The Ghana 2008 bid team has a number of very good examples to buttress their case with. Mali was granted the rights to host the 2000 Nations Cup at a time when they could boost one good stadium. But with government backing, the West African state had developed five new grounds and a number of solid housing units Burkina Faso two years earlier also rode on the back of CAF's goodwill and government backing to organise a good nations cup few had deemed possible. Unfortunately for Ghana, CAF's trust has not always been rewarded that well by the various countries. Zimbabwe threw the 2000 Nations Cup off balance at the last minute when they failed to meet CAF's demand for the hosting of the tournament. Malawi and Kenya have all proven in the past sometimes going with the countries with facilities is the smart thing. That could help explain why CAF opted to give the 2004 nations cup and the 2006 event to two countries skilled at staging the event; Libya and Tunisia. Ironically too the fact that those two countries are involved has given Ghana another potent argument. Bid members have not lost the slightest opportunity to remind anyone who cares to listen that if Libya is handed the hosting rights in 2008, it will be three in a row for a North African country. That argument could knock out Gaddafi's country but so could the argument by South Africa that they have everything in place to organise a fabulous Nations Cup in 2008 and test the preparedness of their facilities for the 2010 event knock out Ghana.